Jumierah Beach Hotel: Opulence, Decadence or Just Plain Ridiculous? At $650 a night – the cost of a pair of Manolo Blahnik every 24 hours, Jumierah Beach Hotel sets itself up for some high-flying expectations. 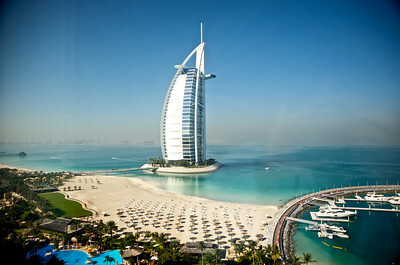 It is not as famous as its big brother icon the 7-star Burj Al Arab, which is a gold bullion’s throw away. But the Jumierah Beach Hotel is also an impressive edifice that was designed by the same architects who mastered the towering sailing ship hotel the Burj Al Arab. Unlike the Burg Al Arab, where the starting price for a suite is $6,000 a night – yes, that is $6,000 US dollars (think of how many pairs of shoes you can buy with that!) our room at Jumierah Beach Hotel is a paltry $650 a night. Now, I have stayed in some impressive hotels and villas that have been worth the green, these include Hotel de Paris in Monte Carlo (around$600 a night), Banyan Tree Resort and villas in Phuket (starting at $700) and my ALL TIME favorite hotel experience ever! and Four Season in Budapest (starting at $400). Each of the hotels were beautifully designed with amenities like heated floors and private butlers, and when you drop that much cash for a bed and shower I expect thick, warm towels and original artwork in my room. It seems that art is not a top priority here at the Jumierah Beach Hotel (unless you count chrome trimming as art), nor is big cozy towels. I am sad to report that most of our towels have been riddled with holes and trimmed with ragged edges – yes really. You would think that if you are charging $650 a night, you could at least buy new towels once in a while. Really, I wouldn’t complain about towels except that the room cost is ridiculous. When you start charging people that much money, expectations start climbing. What I find interesting is that most of the guests are Russians. I have not met any Americans here yet (I guess they are spending $150 a night in Mexico). So, I’m thinking that the Russians aren’t that concerned about the towels. Would I come back? Nope. Because it is an Arab state, alcohol is ridiculously expensive. I’m not an alcoholic, but $20 for a cheap glass of sparkling wine is just crazy. The flight from SFO is long – 17 hours direct flying Emirates. The tickets were only $1,000 round trip, but that was crammed in economy. I am pretty easy on flights, but I had a bit of an issue on this flight. I flew over with my husband Tim, and we bought 3 seats so we would have some space. Well, when dinner came around, all they had left for dinner was lamb curry. Ick. I hate lamb. Now, you would think that because we bought 3 seats, one of our seats would have an option of our meal choice. After a 30-minute search, they found me a left over chicken dish from business class. Lucky me. We are scheduled to fly back on Saturday, but I think we are going to come back earlier. Dubai is a big city that feels like Las Vegas and Monte Carlo’s tawdry love child. So far, I’m not impressed, so if you live in Dubai and want to change my view of this city. I’m all ears.